Pre-workoutScitec Hot Blood 3.0 - 90kaps. 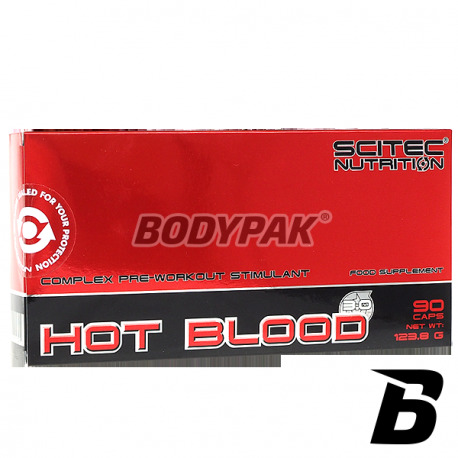 Scitec Hot Blood 3.0 - 90kaps. If you want to reach the limits of inflation muscle mass growth, strength, energy and focus, take HOT BLOOD. The unique formula works by supporting the renewal of the ATP-CP energy and increasing the size of your muscle cells. New Scitec Hot Blood 3.0 is a powerful maximum aid training, which provides the most important components for the muscles during intense training. 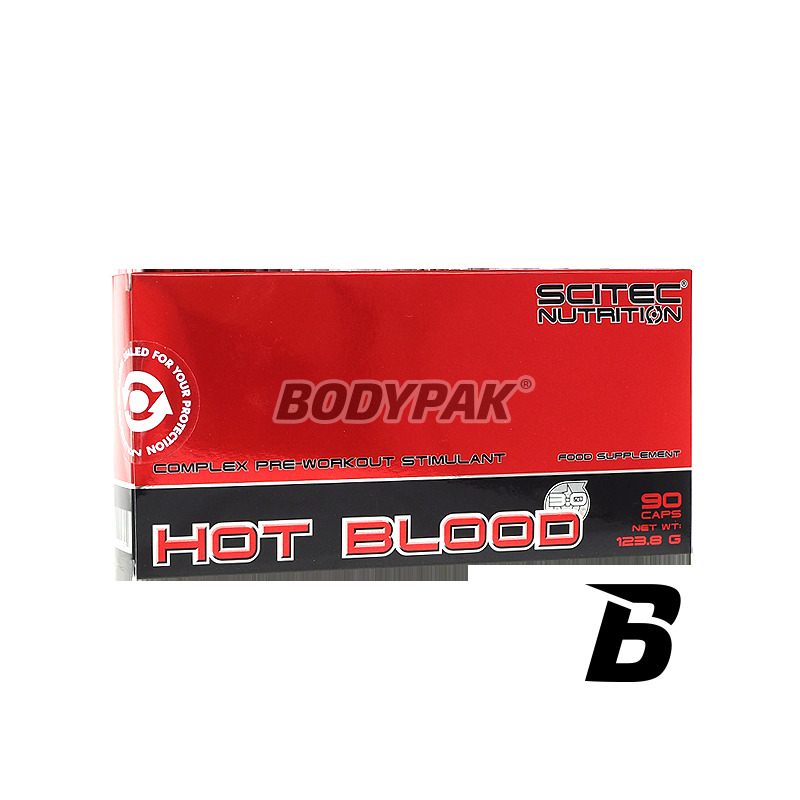 Pre-workout formula sports supplement Scitec Hot Blood 3.0 is an advanced supplement before training already operating the first and each subsequent portion. What makes the preparation sports Hot Blood 3.0 is so strong? First of all, its unique composition, in which they were contained massive doses of synergistically acting active substances. Thought appropriate composition and quantity of the substance provides a unique workout every time. Scitec Hot Blood 3.0 stimulates the production of nitric oxide and oxygen transport with nutrients, which provides a powerful pump during exercise and the effects in the form of muscle mass! During exercise or other physical activity you reach a certain level of intensity, body temperature and blood rises, it follows that you can work more efficiently. Hot Blood formula has been carefully designed to support the body during intense physical activity, especially during a very intense workout! * Information has been scientifically validated by the European Food Safety Authority. Food Safety. Creatine monohydrate, creatine citrate, creatine pyruvate, Kre-Alkalyn (buffered creatine monohydrate), Micronized Creatine Monohydrate MicronTec. L-arginine, L-tyrosine, caffeine anhydrous, beta-alanine, green tea extract, alpha-ketoglutarate of L-arginine, taurine, acetyl-L-carnitine HCl, L-carnitine tartrate, DL-malate, L-citrulline, Niacinamide, Alfa lipolowy acid, grape seed extract, Bioperine (piperine). Ingredients: creatine monohydrate, L-arginine base, the capsule (bovine gelatin, colorant: titanium dioxide, red iron oxide, Allura Red AC **), L-tyrosine, anhydrous caffeine, beta-alanine, an extract of Camellia sinensis (50 %), alpha-ketoglutarate of L-arginine, 2: 1, taurine, anti-caking agent (magnesium stearate) Acetyl L-carnitine HCl, creatine citrate, creatine pyruvate, KRE-alkalyn (buffered creatine monohydrate), L-carnitine tartrate, L L-citrulline malate 1 1, micronized creatine monohydrate MicronTec, Nicotynamid, alpha-lipolowy, 95%, grape seed extract, fruit extract, black pepper. ** It can have an effect on activity and attention in children.